You might have noticed a new advert at the bottom of the page. It's for the Homeless World Cup which kicks off in a couple of weeks in Milan. 48 teams of homeless people from around the world will travel to Italy. 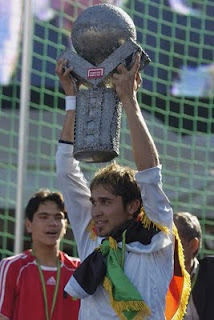 Milan is the seventh tournament and the event has grown and grown since it sprang to life in Graz in 2003. Afghanistan were crowned champions in Melbourne last year. A couple of Scottish connections: The tournament was devised by Mel Young who started the Big Issue in Scotland and is one of the world's most respected social entreupreuners. The Homeless World Cup is based at Easter Road. Scotland won the 2007 tournament. Edinburgh was host city in 2005. The stats that matter: One billion people are homeless around the world. Football can unite people of all nations to move towards one common goal. 73% of the players involved in the Homeless World Cup significantly improve their lives by beating addictions, finding work or accomodation or moving into education. Many players are now working in football and some have become professional players. Football is big, bloated and often ignorant. But the Homeless World Cup shows that it can still inspire people, bring people together and improve lives. I'll post more as the tournament gets closer. In the meantime please visit the Homeless World Cup website to find out how you can help.